Carole Shorenstein Hays has announced that San Francisco�s Curran Theater will welcome Former FBI Director James Comey (Monday, April 23) and former White House photographer Pete Souza (Thursday, May 10) as part of Curran�s popular �SHOW & TELL� series, featuring provocative, topical and entertaining one-night-only events. From the White House to the Great White Way, �SHOW & TELL�s� all-star lineup also features some of the theater�s most celebrated artists, including the writers and creative minds behind �Soft Power,� David Henry Hwang and Jeanine Tesori (Thursday, May 17) and Broadway legend Patti LuPone (Friday, June 1). 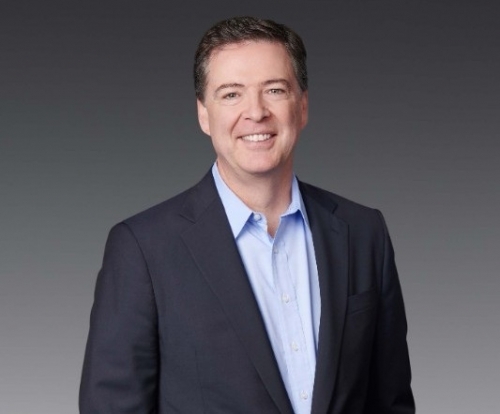 James Comey - Monday, April 23 at 7 p.m. (Tickets: $45�$85). During Barack Obama's two terms, Pete Souza was with the President during more crucial moments than anyone else--and he photographed them all. Souza captured nearly two million photographs of President Obama, in moments highly classified and disarmingly candid. The #1 New York Times bestseller �Obama: An Intimate Portrait� reproduces more than 300 of Souza's most iconic photographs with fine-art print quality in an oversize collectible format. Together they document the most consequential hours of the Presidency--including the historic image of President Obama and his advisors in the Situation Room during the bin Laden mission--alongside unguarded moments with the President's family, his encounters with children, interactions with world leaders and cultural figures, and more. Souza's photographs, with the behind-the-scenes captions and stories that accompany them, communicate the pace and power of our nation's highest office. Every ticket purchased includes a signed copy of �Obama: An Intimate Portrait� with a signed bookplate. An in-person book signing is included with VIP experience. Two of theater�s most unique and contemporary artists, David Henry Hwang (M. Butterfly) and Jeanine Tesori (Fun Home) engage in a conversation about creating, collaborating, and the genesis of their exciting new work, �Soft Power,� before it comes to Curran�s stage June 20 � July 8. They provide a rare peek behind the curtain that will show us what it really takes to get plays and musicals from Idea to Opening Night. This SHOW & TELL is hosted in partnership with CAAMFest 2018 in celebration of Asian Pacific American Heritage Month. CAAMFest, formerly the San Francisco International Asian American Film Festival (SFIAAFF), celebrates its 36th year of showcasing film, music, food and digital media from the world�s most innovative Asian and Asian American artists. The festival takes place in the Bay Area May 10-24, 2018. One of the most celebrated performers of our time, Patti LuPone returns to the Curran stage to reveal the mindset and process of the actor as only she can, while discussing highlights from her legendary career on the stage and answering audience questions. Additional �SHOW & TELL� events include heralded award-winning playwright and actress, recently of �Black Panther� fame, Danai Gurira and Tony Award-winning director George C. Wolfe. Event dates and times for these events will be announced at a later date. Tickets for SHOW & TELL events start at $29 and some include autographed books and special VIP opportunities. Tickets are available by calling 415-358-1220 or visiting SFCURRAN.com. The Curran�s official reopening, following an extensive, two-year, top-to-bottom renovation, became one of the most widely discussed and covered cultural happenings in San Francisco. A key component of the national movement to renovate and revitalize America�s great culture palaces from coast-to-coast, the Curran�s impact has resonated far beyond the seven square miles of its hometown. Photo caption: Former FBI Director James Comey will be a featured speaker as part of the Curran Theatre's popular "Show and Tell" program.